In Windows 10, you can use assigned access to create a kiosk device, which enables users to interact with just a single Universal Windows app. This topic describes how to implement a kiosk app, and best practices. Assign one app to an account. When a user logs in, they will have access to only this app and nothing else on the system. During this time, the kiosk device is locked, with the kiosk app running above the lock screen. This experience is often used for public-facing kiosk machines. see Set up a kiosk on Windows 10 Pro, Enterprise, or Education for more information. You can assign one or more apps to an account. When a user logs in, the device will start in a restricted shell experience with access to only your selected apps. See Create a Windows 10 kiosk that runs multiple apps for more information. This article describes the single-app kiosk experience only. In the multi-app experience, selected apps run in a regular desktop context and require no special handling or modification. A feature that allows a system administrator to manage the user’s experience by limiting application entry points exposed to the user of the device. For example, you can restrict customers at your business to using one app so your PC acts like a kiosk. Whenever someone signs in with the specified account, they'll only be able to use that one app. They won't be able to switch apps or close the app using touch gestures, a mouse, the keyboard, or hardware buttons. They also won't see any app notifications. An application that either takes advantage of the ability to set a dynamic wallpaper or that takes advantage of the new lock extensibility framework. An application that launches above the lock screen while lock screen app is running (for example, when the desktop is locked). An application that runs normally, in an unlocked Windows context. A WinRT class that allows above lock screen apps to request that the device unlocks, and allows the app to register to be notified when the device begins to unlock. Each view is a separate window into the app. An app can have a main view, and create multiple and secondary views on demand. See ApplicationView for more information. Assigned access in Windows 10 leverages the lock framework. When an assigned access user logs in, a background task locks the desktop and launches the kiosk app above the lock. The app's behavior may differ, depending on whether it uses the windows.aboveLockScreen extension. Using windows.aboveLockScreen enables your kiosk app to access the LockApplicationHost runtime class, which enables the app to know when it is running above the lock (and therefore running as a kiosk experience). If an instance cannot be returned, the app is running in a regular desktop context. secure your kiosk experience by creating a separate page to display kiosk-only content. Call the LockApplicationHost.RequestUnlock() method from your app to exit Assigned Access mode and go back to the login screen. Add an event handler to the *LockApplicationHost.Unlocking event that fires when a user presses Ctrl+Alt+Del to exit the kiosk experience. The handler could also be used to save any data before exiting. Regardless of whether your app uses the extension, be sure to secure its data. See the guidelines for assigned access apps for more information. Starting in Windows 10, version 1607, there is no longer a restriction on the Universal Windows Platform (UWP) extension, so most apps can be shown in Settings when user configures assigned access. This section applies to a Kiosk application that uses the windows.aboveLockScreen extension. Inside the override of the OnLaunched function in App.xaml.cs, try to obtain an instance of the LockApplicationHost class before rootFrame navigation. If the call fails, the kiosk app should launch normally, under the lock. If the call succeeds, the kiosk app should launch above the lock running in assigned access mode. You may want this version of the kiosk app to have a different main page to hide sensitive information. The following sample demonstrates how to do this. AssignedAccessPage.xaml is predefined, and the app navigates to AssignedAccessPage.xaml once it detects that is running in above lock mode. As a result, the normal page would display only in the under lock scenario. You can use this method to determine if the app is running above lock screen anytime in the app lifecycle and react accordingly. Starting in Windows 10, version 1803, Multiple views are supported in the kiosk experience for apps that do not have the windows.aboveLockScreen extension. To use multiple views, ensure the kiosk device’s Multiple displays option is set to Extend these displays. When an app with multiple views (and without windows.aboveLockScreen) is launched during a kiosk experience, the main view of the app will be rendered on the 1st monitor. If a new view is created by app using CreateNewView(), it will be rendered on the second monitor. If the app creates another view, it’ll go to the third monitor, and so on. Kiosk devices can only display one view per monitor. For example, if the kiosk device has only one monitor, it will always show the main view of the kiosk app. New views created by the app will not be displayed. When a kiosk app has the windows.aboveLockScreen extension, and is running above the lock, it’s initialized differently. Its main view is located under the lock, with a secondary view above it. This secondary view will be what the user will see. Note that even if you don’t explicitly create any new views, you’ll still have two views in the app instance. You can run the following code in the main window of your app (in assigned access mode) to see the view count and whether the current screen is the main view. Each view or window has its own dispatcher. Because the main view is hidden to the user, use GetCurrentView() to access the app’s secondary view running above the lock instead of MainView(). Because of this, you cannot have multiple views or run on multiple monitors. If your app needs to support either, you will need to remove the windows.aboveLockScreen extension from your app. In some situations, the power button, escape button, or other buttons used to stop an application may not be enabled or available on the keyboard. In these situations, provide a way to stop assigned access, for instance a software key. The following event handler shows how to stop assigned access mode by responding to button click event that could be triggered by a software key. A kiosk app's lifecycle is handled by the assigned access framework. If the app ends unexpectedly, the framework will attempt to relaunch it. If however, a user presses Ctrl+Alt+Del to bring up the login screen, an unlocking event is triggered. The assigned access framework listens to the event, and will try to terminate the app. Your kiosk app can also register a handler for this event and perform actions before exiting. Saving any data is an example of this. See the code below for an example of registering a handler. The user knows the assigned access account password and unlocks the desktop. 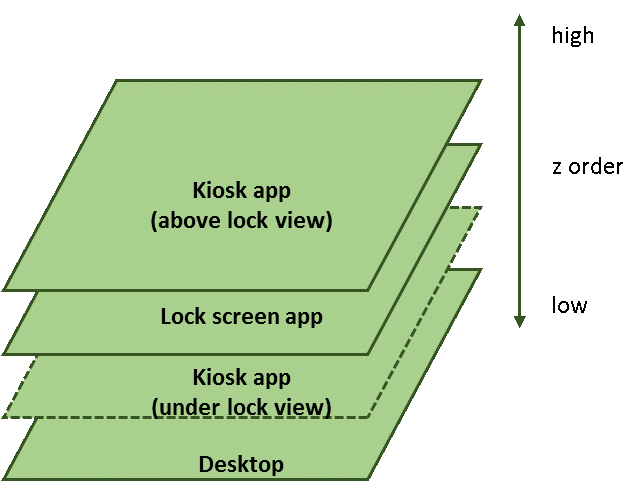 The assigned access framework starts, locks the desktop, and the lock screen app launches which in turn launches the kiosk app. The user doesn’t know the password or doesn’t take any further action. The login screen timeouts and the desktop relocks; the lock screen app launches which in turn launches the kiosk app. The following function call will end up with a runtime exception if it’s invoked in assigned access mode. If the same app, when used under lock, calls the function, it does not cause a runtime exception. It’s helpful to use LockApplicationHost to determine the app's assigned access mode, and code your app accordingly, such as not creating new views if the app is in assigned access mode. The following sample application manifest uses the windows.aboveLockScreenUWP extension. Open Event Viewer. There are two likely places to find activation errors. In the Event Viewer (Local) pane, expand Windows Logs, and then click Application. Also, in Event Viewer (local), expand Applications and Services Logs, expand Windows, expand Apps, and then click Microsoft-Windows-TWinUI/Operational. Note that because kiosk apps with assigned access do not run in full-screen mode, ApplicationView.GetForCurrentView().IsFullScreenMode will return false.